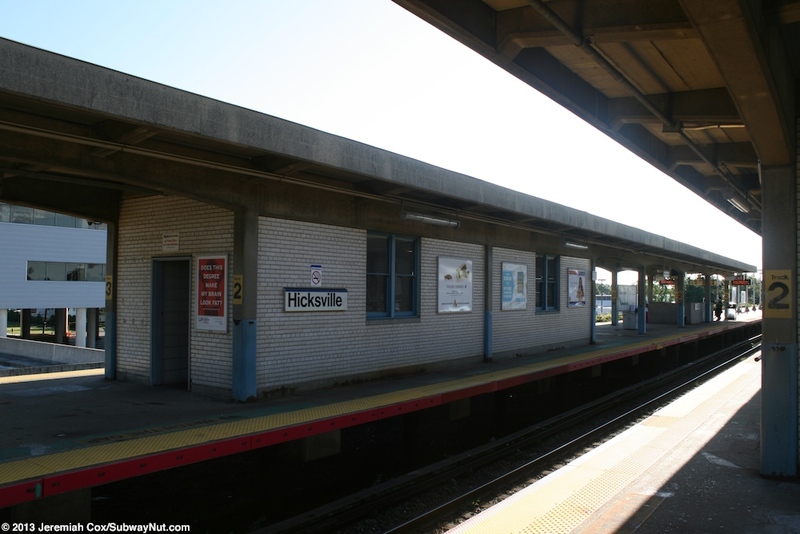 Hicksville is an important LIRR and busy Junction Station. 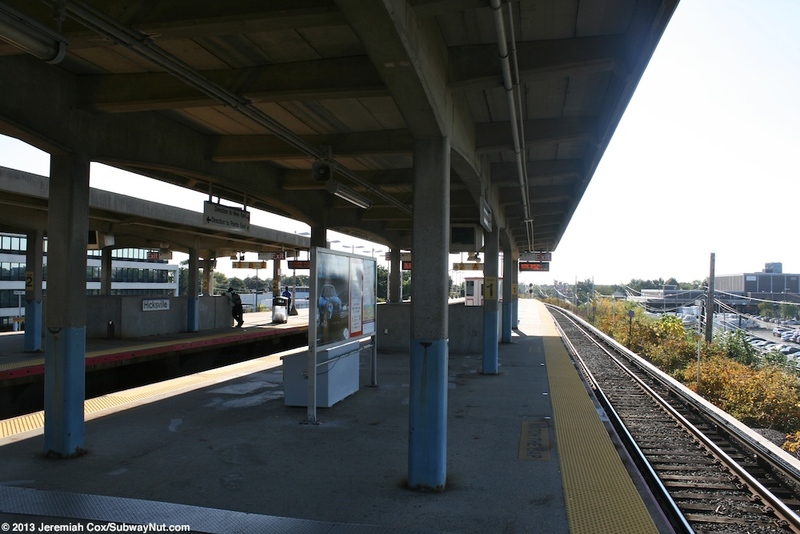 It is where the Port Jefferson branch splits off the Main Line, Ronkonkoma Branch. 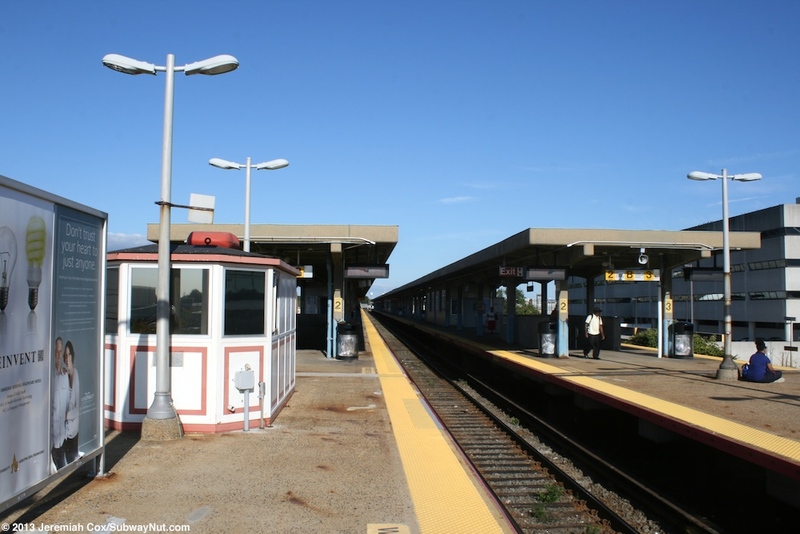 The stop is extremely busy and sees service from about 3 trains per hour or better on the Port Jefferson and Ronkonkoma Branches. 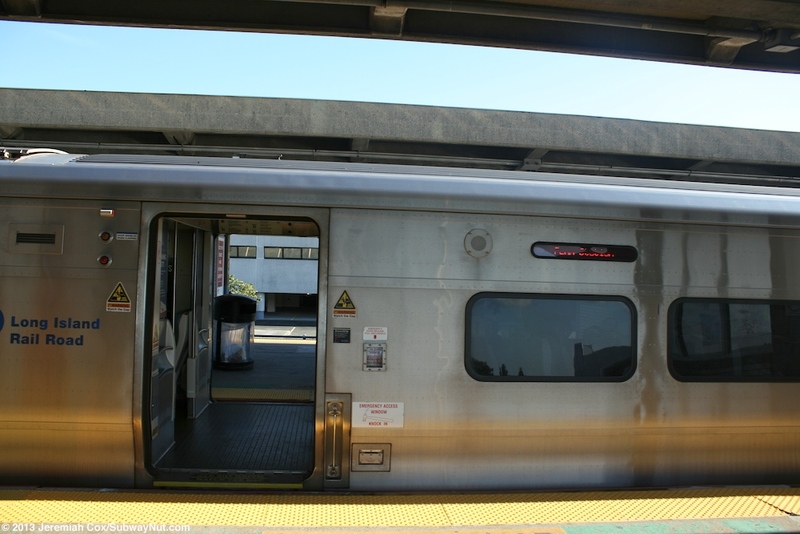 The stop is the terminus of a few of the Diesel 'Scoot' Shuttle trains that run to and from Port Jefferson (about every 90 minutes) on weekdays connecting with electric Ronkonkoma Branch trains. On most shuttles passengers transfer to electric trains at Huntington instead. 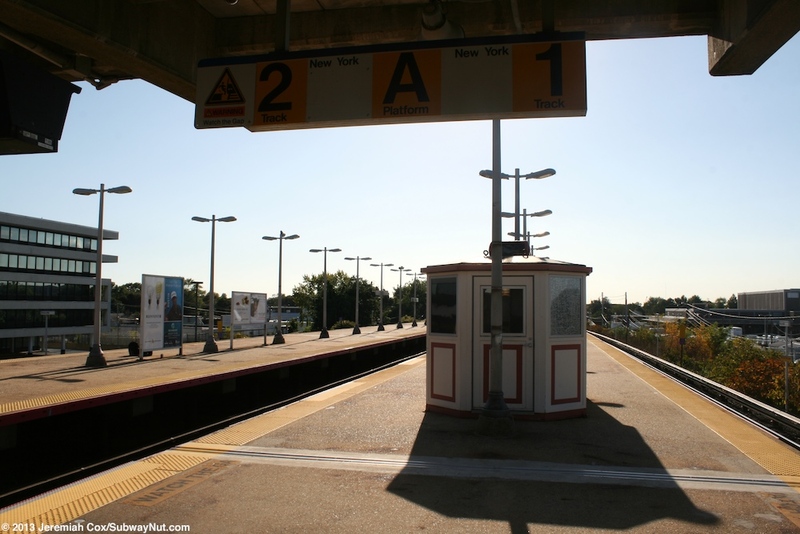 On weekdays two eastbound and one westbound Montauk Branch trains stop in the station that run via the Central Branch. 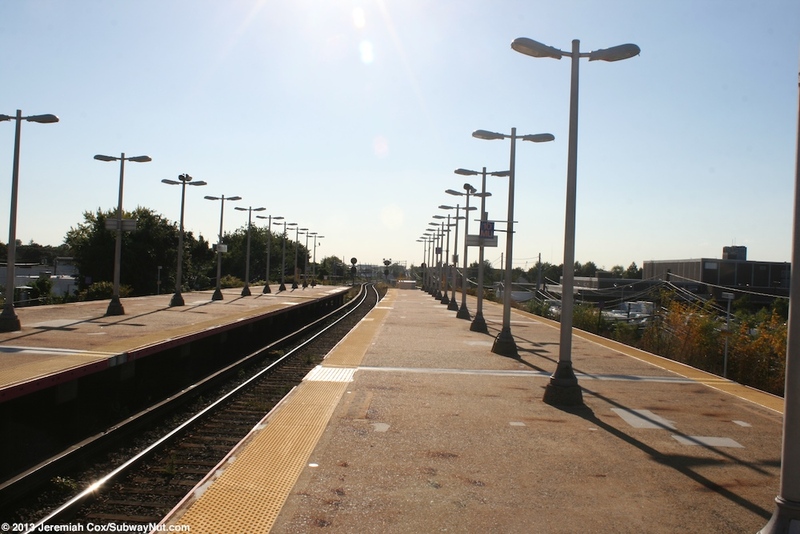 Additional Montauk Branch trains bypass the station since diesel trains that run non-stop from Babylon to Jamaica can be routed via either the main Montauk (Babylon Branch) Line or up via the Central Branch and Main Line, these trains will go through Hicksville bypassing it. 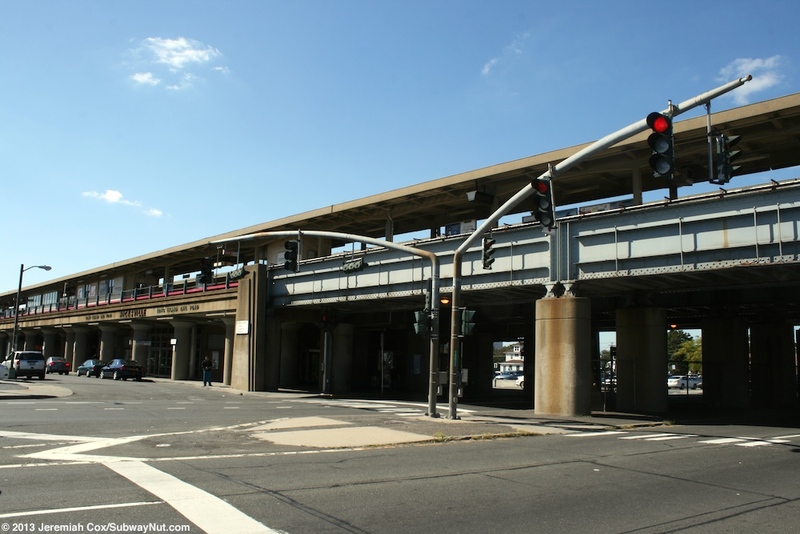 The stop itself was elevated onto the Concrete Viaduct it is currently on and opened on September 12, 1964 and electrification arrived in 1970. 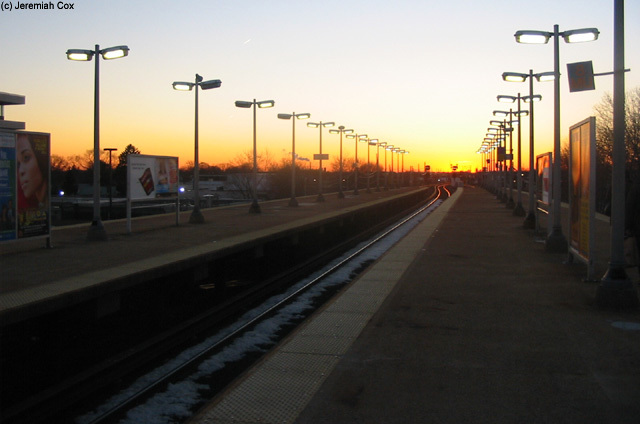 It feels like many of the stations on the Babylon Branch, the eastern half of the station is located on a concrete ariel guideway held up by round concrete pillars. The western half is on an embankment with slopes of vegetation running down from each side of the station platforms. On this guideway are three tracks with the two island platform design. 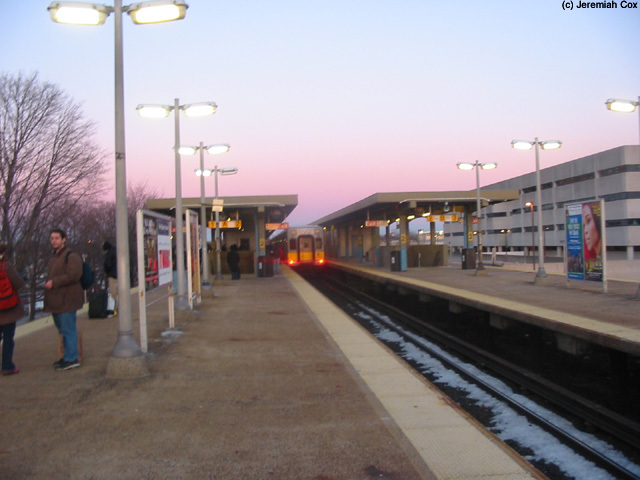 Trains that stop on the middle track #2 open their doors on both sides for both platforms. 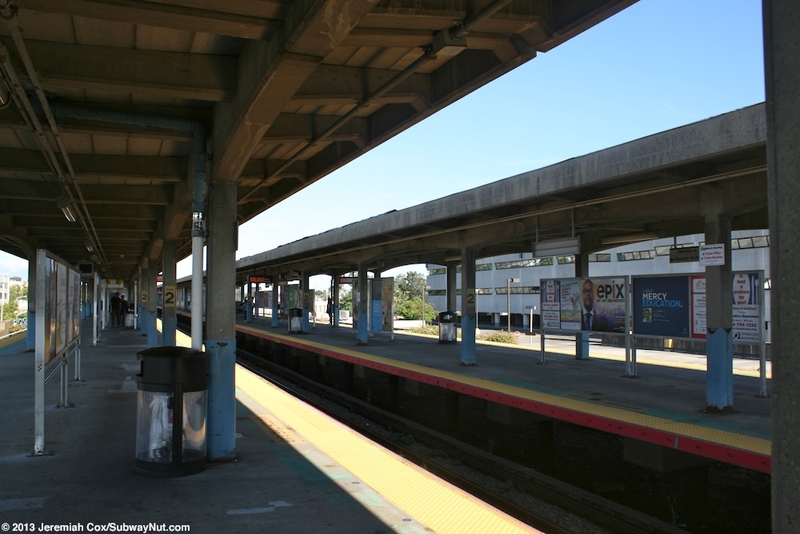 The platforms are canopied with concrete posts (with blue pealing paint on portions) holding up a concrete framework holding up what appear to be wooden planks expect for the easternmost quarter of both platforms. 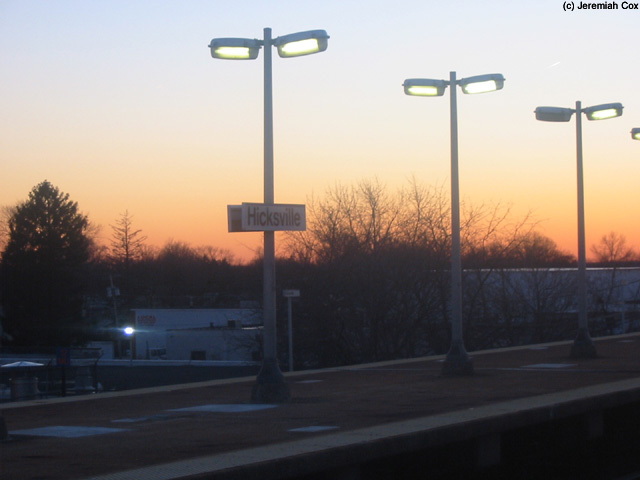 These exposed portions have silver lampposts with unusual lights that look more suited for a highway than a railroad platform. 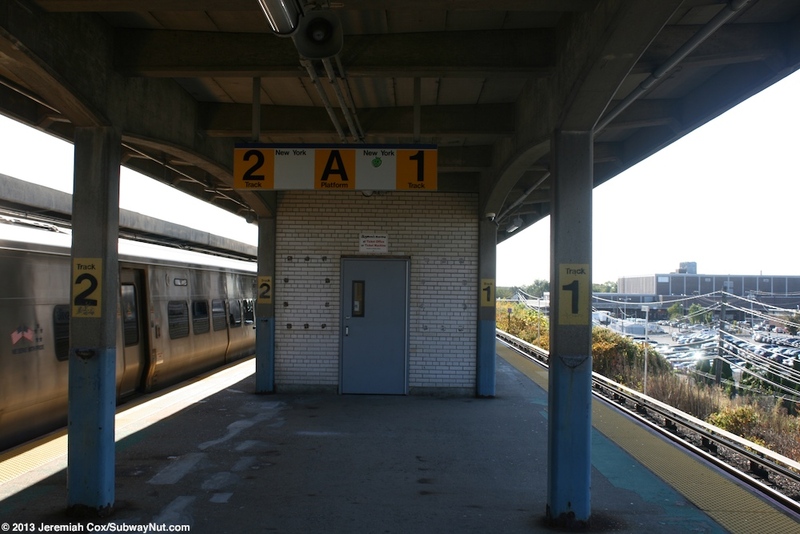 All exits are with the portion of the platforms that are canopied. Starting from the western end there is first a staircase down from each platform signed for W. Barclay St and Duffy Avenue. This leads down to a dark underpass tunnel inside the portion of the platform that is set above an embankment. The northern end of the tunnel leads directly to one of the many parking lots north of the station (and Barclay Street north of them). The walkway to Barclay Street south of the station is quite confusing. After the overpass ends there is a graffiti covered staircase up to a walkway along the top of a two story parking garage the walkway then goes through the through the middle level of the parking garage. It emerges on Duffys Avenue at an entrance with an awning for the New York Sports Club located in the garage. There is no indication that there is an LIRR entrance through this awning. Next each platform has one of two on platform waiting areas, these are both made of white bricks with blue windows and doors at each end. There are a few simple black benches inside and they seem to be in half decent shape (at least not smelling of urine). 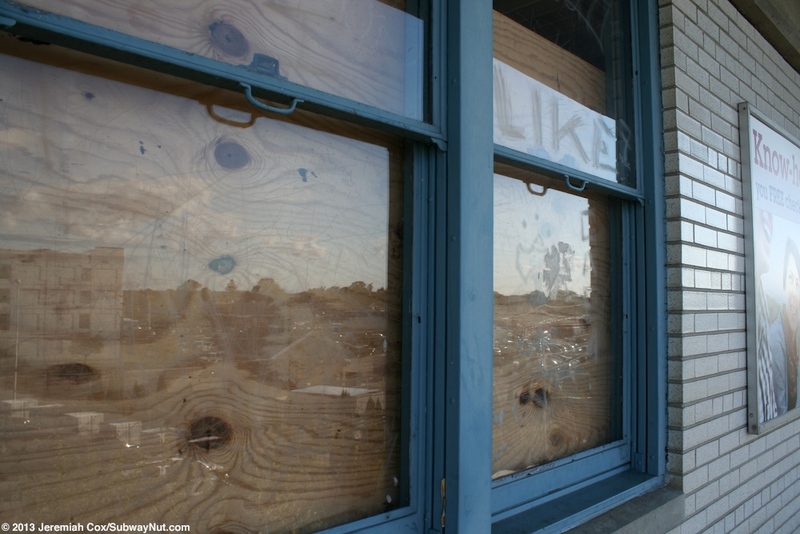 The one here on the New York-bound platform had plywood over some of the windows and the western door was locked with a closed sign. There is a plywood wall in the middle. Next each platform has the main combined staircase and narrow up escalator. The escalator is protected by plexiglass windscreens with silver walls. These lead down to the main station entrance area. 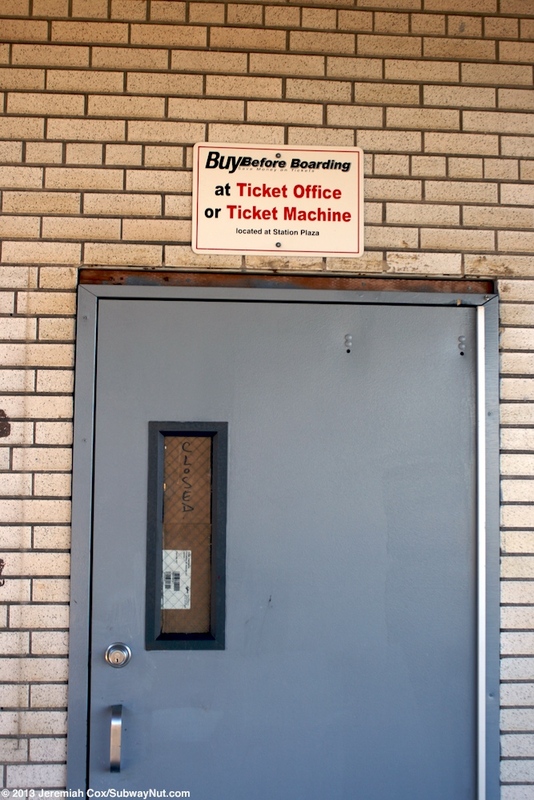 There is a newsstand is a separate kiosk and then a large station house with the ticket office open throughout the day and on weekends with not one but two ticket agents handling transactions. 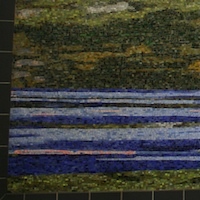 The station house has been recently renovated, there are black benches along both walls beneath murals along with silver pillars in the middle of the platform. In the parking lot north of the station is The Golden Eagle a stone eagle from the now destroyed New York-Penn Station that was acquired by a local Hicksville High School Teacher Samual A. Goldberg in 1965 and was dedicated on October 28, 2010. 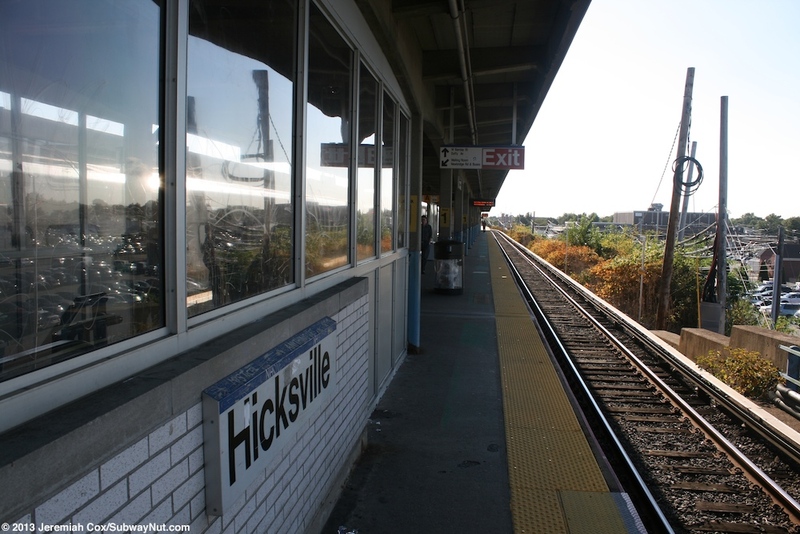 The concrete sides of the viaduct above the entrance lettering spelling out Hicksville and Long Island Railroad. Above on the platform here is the second little on platform waiting area that is identical to the main one. There is then the elevator down from each platform with shafts that extend above the rooflines of both canopies. 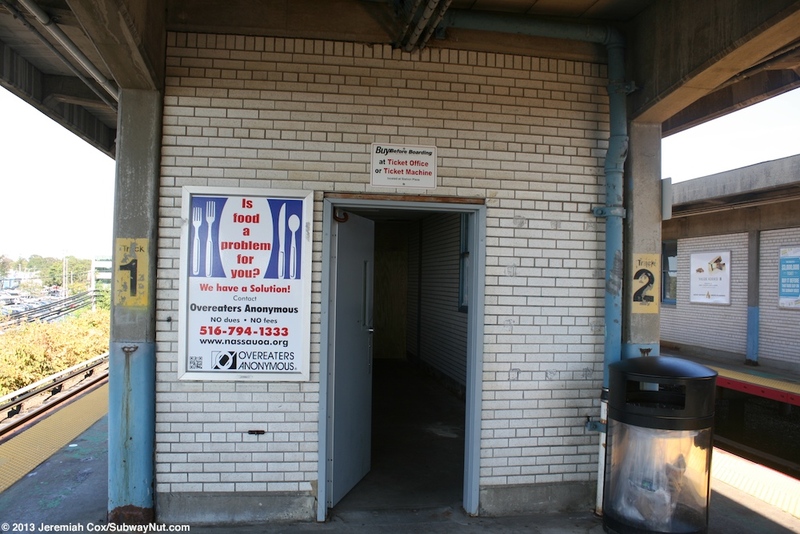 The elevators have white brick enclosures and little silver windscreens surrounding their on platform entrances. These elevators look like their original to the 1960s station and not added later. The platforms then cross above Newbridge Road before there are staircases at their western ends. 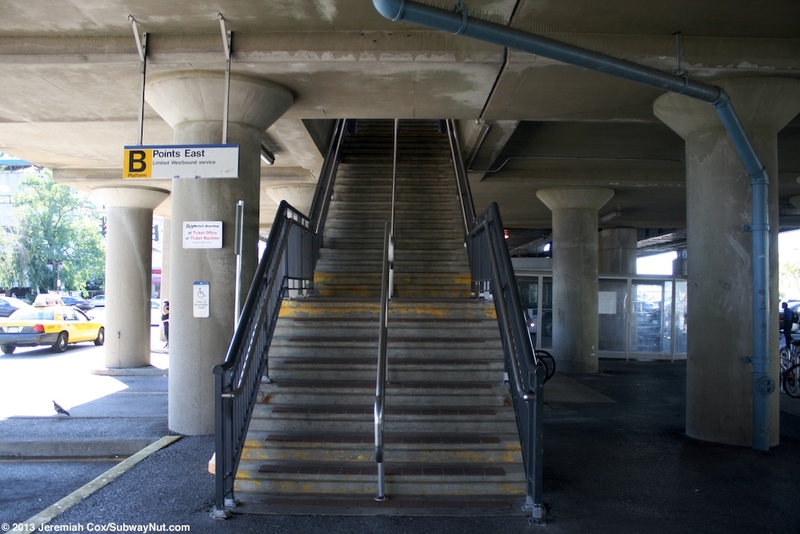 These staircases have signs for the MSBA Buses, these are now NICE bus and still stop at the staircase beneath. 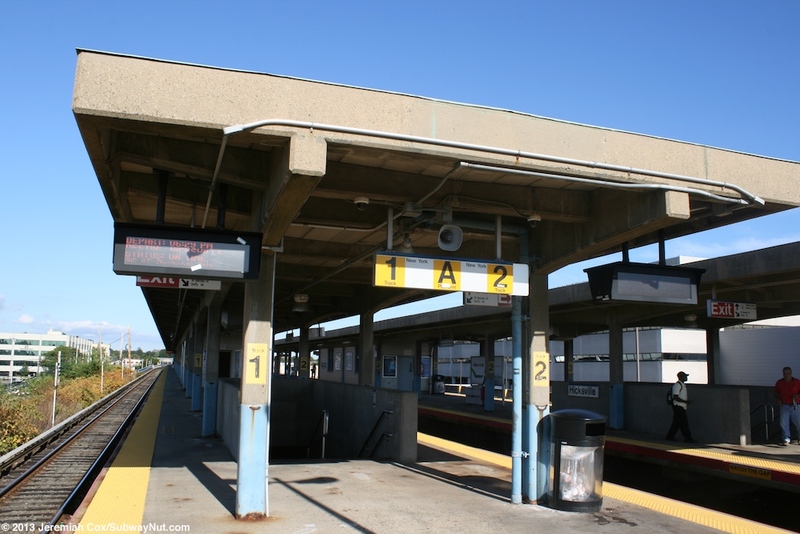 The northern New York-bound platform has just one staircase down at its extreme end, this has green plastic sheathing surrounding the upper landing. 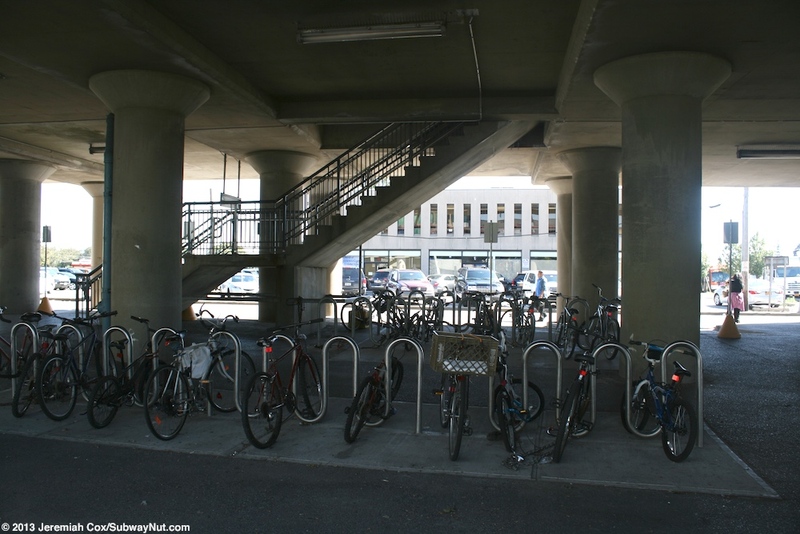 The southern Western Points platform has two conventional staircases down to the parking lot beneath the ariel guideway beneath. The parking lot here has a small building inside it used by a local taxi company. There are plenty of bus passengers waiting for their buses (including routes to Flushing and Jamaica) waiting beneath the station although signage for where the actual stops are could be a bit improved at street level. 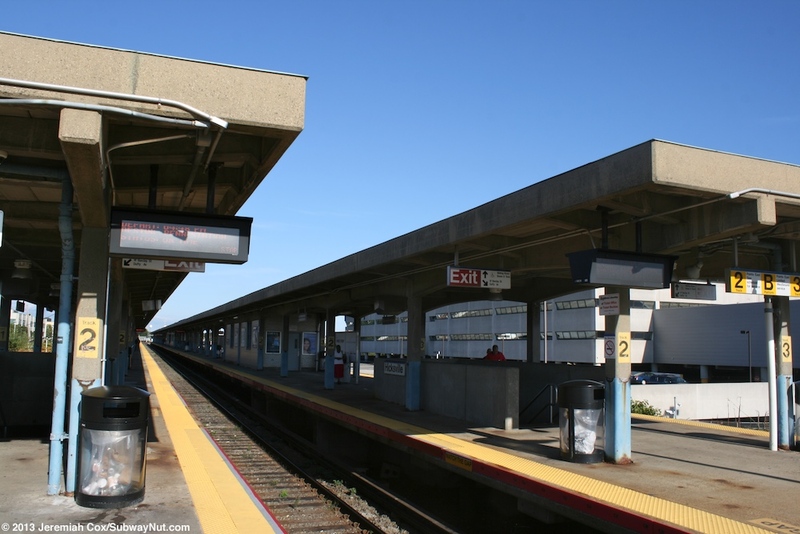 The maps dated to 2006 showing Long Island Bus Connections within the station are aslo out-of-date.